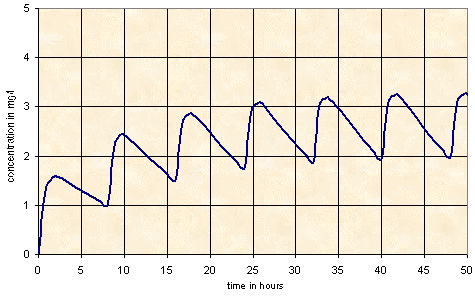 Plasma concentration-time curves of a drug (whose T ½ = 8 hours) after its oral administrations at the same dose and constant interval between intakes. With repeated administrations, when there is a residual concentration at the time of the following administration, the steady-state concentration, Css, is obtained at 5 T1/2, i.e. 40 hours with this example.